HDU signs are the latest thing in, hardy but attractive replacements for those that are made of wood. A petroleum-based substance, “high density urethane” is used as a material for this for a variety of reasons. It hasn’t become so popular that it has replaced high quality woods completely in this respect, but it is gaining a strong foothold in the industry. What exactly is it? Read more here. A Baton Rouge signs company prepares for the 2009 hurricane season with a look back at the damage done by 2008’s Hurricane Gustav to their customers’ signs, such as Ambrosia Bakery. 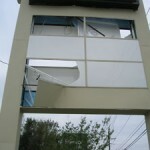 As a local company, Greater Baton Rouge Signs, is able to respond quickly to customers with missing or broken signage after a storm. Baton Rouge, LA (Vocus/PRWEB ) June 29, 2009 — Officially starting June 1, the 2009 Atlantic hurricane season is forecast at a normal level. Experts predict up to three major storms reaching as high as category five and up to 14 named tropical storms. However, as residents in the Gulf Coast region know, hurricanes are not predictable, and preparations should start now for the upcoming months. 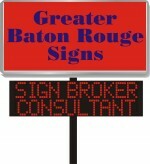 John Kovalcik, owner of Greater Baton Rouge Signs, in Baton Rouge LA, has started to ready his customers and his staff now. Damage to signs from high winds and rough weather can have a big impact on business revenue at any time, but especially in the aftermath of a storm. “We work hard to create a relationship with each of our customers. Hurricane Gustav from last August tested us on our response to getting our customers’ signs back up as quickly as possible,” comments Kovalcik. The damage was done to a joint project for The Magma Group, which consists of Ambrosia Bakery, Yvonne Kelleher’s Rug Place, Lewy Physical Therapy. This project is a prime example of the damage potential from hurricanes. 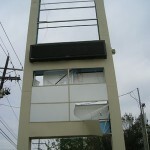 When the job was at the completion stage in late August, the hurricane destroyed the sign with over $10,000.00 of damage. The signs collection affected included the most popular signage available with electronic message boards and lighted signs (flexible panels illuminated with fluorescent lights). With business directly affected by the hurricane, Ambrosia Bakery, who provides cakes and baked good locally and ships Mardi Gras King cakes nationwide, understands the real economic impact of the sign damage. Kovalcik worked diligently with Felix Sherman Jr, of Ambrosia Bakery, who oversaw the sign project on behalf of The Magma Group, to get the sign replaced. His advice to every business is to consider hiring a local, reputable sign company who will work with your business; you should not choose to be just the next customer to a large corporate sign shop. 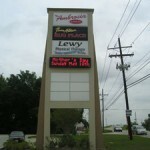 It is this personalized approach that Greater Baton Rouge Signs attributes to their credibility in the local market. Baton Rouge signs company, Greater Baton Rouge Signs, specializes in providing signage for local businesses with responsiveness and customer service. John Kovalcik, as a representative for a national sign manufacturer, developed ‘factory’ connections with numerous national manufacturers. With those relationships, Kovalcik set up his own, Greater Baton Rouge Signs. 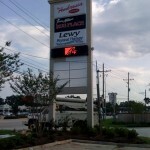 For more information on Baton Rouge signs, please visit http://greaterbatonrougesigns.com, or contact John Kovalcik at (225) 937-3643. Owners Felix and Cheryl Sherman, natives of New Orleans, opened the doors at The Ambrosia Bakery on December 3, 1993. After 15 years, the Ambrosia Bakery has lived up to its name “food of the gods.” They have brought to the people of Baton Rouge creatively designed and delicious cakes, mouth-watering desserts and a taste of New Orleans. For more information on Ambrosia Bakery, please visit http://www.ambrosiabakery.com/ or contact at (225) 763-6489. We always come to your place of business, thereby saving you time, and TIME IS MONEY! By taking a consultative approach to your business' needs, we help you find what works best for your business when it comes to advertising. John with Greater Baton Rouge signs was a pleasure to work with. He is knowledgeable, promptly responds to questions and inquiries, and delivers a quality product at a very fair price. John always has your best interests in mind and will guide through the entire process. Call today - 225-937-3643 | JDK & ASSOCIATES, LLC DBA Greater Baton Rouge Signs All rights reserved.